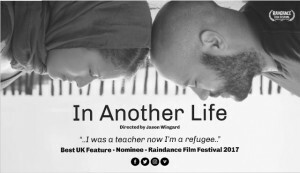 Kicking of at 12.00 noon screening and discussion of local filmmaker Jason Wingard’s first feature IN ANOTHER LIFE. Following the screening Jason and co-producer Hannah Stephenson will have a Q&A with Festival Programmer Steve Balshaw. the eyes on this camp and I can see it. The blank emptiness of desperation.In another life I was a teacher. Now I’m a refugee. My name is Adnan. In Another Life, Directed by Jason Wingard. Co-producers, Hannah Stephenson, Rebecca Clare Evans, Chris Bouckley. ← Programme Manager’s Thursday Recommendations!